I know I'm not the only one who loves searching the Internet for new recipes to try, right? Have you ever searched for the older recipes of the 1800 and early 1900's? I did this a few days ago and just have to share what I found! Let me just say that I had to Google some of the ingredients and terms I found in these recipes - a few I never heard before! It was definitely an interesting adventure that I'm so glad I took! I haven't tried any of these recipes yet, but I definitely intend to do just that! 2. Johnnycakes & Bacon Pankcakes from the Oregon Trail. I know what you are thinking and I was, too! Why didn't I ever think of Bacon pancakes! Check out this awesome recipe used while traveling the Oregon Trail! You will need to scroll down a little bit on the page, but check it out here. 3. Chocolate Carmels. A recipe from 1893! Okay, this one had me at "a piece of butter as big as a walnut" - who needs measuring spoons, right? I definitely need to try this recipe! Check it out here! 4. Huckleberry Blue, Wigg-Waggs, and Indian Slapjacks. Need I say more? Check out these recipes from the Oregon Trail. Be sure to read the entire article as it is quite intriguing! Check it out here. 5. Not a recipe, but a great website. Okay, this is not a recipe (although there are recipes on this website) but if you are interested at all in the way your ancestors ate in the mid 1800's, check out this link. It gives a typical weekly menu of the middle-class family in 1843. Did you know dinner was eaten between noon and 3pm? That was interesting to me! Check it out here. 6. Cookery as it should be: a new manual of the dining room and kitchen by Practical Housekeeper. Okay. This is it! Stop what you are doing and go check this out! If you are even a little interested in food, family, and recipes of the 1800's then you will find this amazing! It is online and available to view from Google Books (there is even a downloadable eBook). Check it out here. 7. Mud apples, Pocket Yams, Hoe Cakes, oh my! 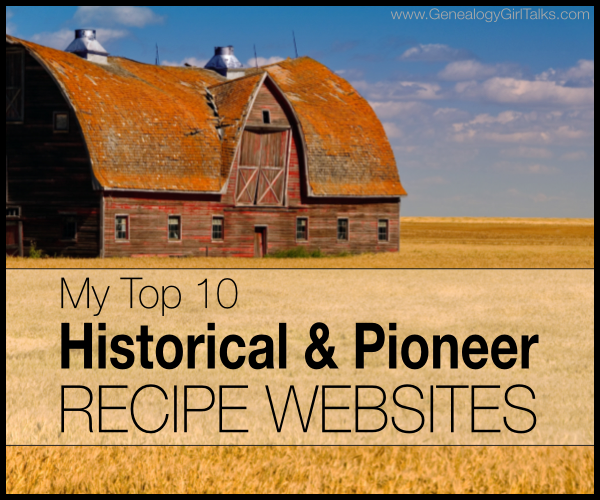 Check out this awesome website for a list of amazing pioneer recipes. Originally listed as "for kids" these recipes are a few that I need to try! You can check the website out here. 8. Recipes & Household tips! What more could you ask for? This website has a quite large list of recipes that are very well organized! Pickling, soups, stews, household tips and more! Click the link here. 9. Susie's Layer Cake Recipe. This recipe is from the early 1900's - more than 100 years ago! It sounds delicious! Check it out here. 10. A lump = 1 Tablespoon. Wow! There are some fascinating facts on the short little website! A list of Pioneer Cooking Terms, a cute little rhyme for determining if berries are safe, and a list of recipes at the top! You won't want to miss this website! Check it out here! Do you have any favorite pioneer recipes? Share them (or a link to them) in the comments below! My grandmother and mother made tea cakes. They hail from Arkansas. I have the recipe but it's supposed to be a family secret. LOL. Love your website and what you are doing in expanding the meaning of family research. Love this, thank you. I am a lover and believer in old recipes. They are well and truly tried and tested and work great on a budget. Plus they use real food not processed.